During the 2017-18 athletic year, all 20 varsity sports at Texas reached the postseason. Chris Del Conte urging fans to wear burnt orange on Fridays, support the program. For Texas athletics, the 2017-18 athletic year was successful. Taken on the whole, it always is. 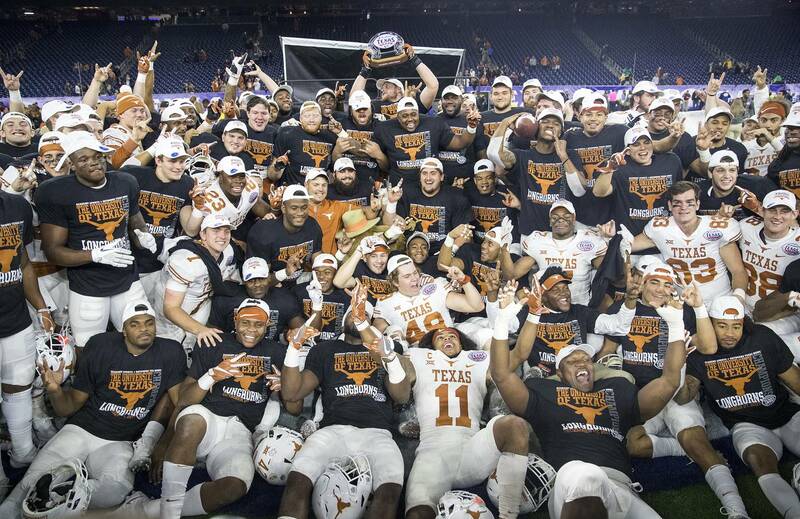 Sure, the Longhorns enjoyed their typical success in non-revenue sports. Texas hauled in yet another national championship in men’s swimming and diving, its fourth straight and 14th overall under legendary lion Eddie Reese. The men’s and women’s golf teams both showcased shining future pros. Volleyball was solid again, and after some bumpy times, both soccer and softball got back on the winning track. In fact, all 20 of Texas’ varsity sports reached the postseason. No other school in Division I athletics had a 100-percent success rate. Texas teams produced 10 top-10 season finishes at NCAA championships, tied for the fifth-most in school history. “We’re all, I think, headed in the right direction,” football coach Tom Herman told the American-Statesman in May. But setting aside wins and losses, this athletic year will be remembered most for being radically transformative off the field. It was the year that UT brass finally awoke to a harsh reality: Texas athletics had become a complacent, opaque behemoth that relied too much on fan loyalty and faded glory. Folks got lazy. It was also the year where the Longhorns took decisive action. After the football team posted a 6-6 regular-season record, UT President Gregory L. Fenves sensed the natives were restless, possibly drifting toward apathy. He needed to hire a permanent athletic director. So he conducted a quiet search on his own. No search committee, no interference from overzealous boosters. Del Conte dominated the introductory press conference, cried along the way and won the room. Fenves couldn’t have been happier. His new athletic director hit social media hard, even on Christmas Day, responding to fans directly and engaging them in a way no one from UT ever has. His bold message to everyone this spring was simple: Be proud to be a Longhorn. Wear orange on Fridays. Put a flag in your yard. Essentially, he asked fans to proudly raise the “Hook ’em” hand sign. “Don’t ever be afraid to tell people, damn right I’m a Longhorn,” Del Conte told fans in Dallas on the “This is Texas Tour” stop. The football program is 53-48 since the start of the 2010 season, the one immediately following Texas’ last appearance in a national championship game. “We have to own that,” Del Conte said. To get fans excited again, Del Conte put a laser-like focus on improving the game-day environment. He announced plans for “Bevo Boulevard.” Cars along San Jacinto Blvd. would be removed and the entire street outside Royal-Memorial Stadium will become a “carnival,” he said. And he wants to spend $10 million to build a hall of honor inside the north end zone of Royal-Memorial Stadium. He dramatically reduced the amount of advertisements played during games and warned fans they may not like the music choices. The players will, though. The previous game script was more than 20 pages. “Now, it’s basically front and back,” he said in May. Frankly, these are some of the same things former athletic director Steve Patterson pursued. “Same strategy, better packaging,” one former UT athletic department employee said. Del Conte also killed a student wristband policy that created chaos last season. This season, student seating is first come, first served. Students also will be moved from the northeast corner to the southeast corner. Visitor seating, previously located in the southeast corner, is now in the upper deck. That puts more Texas fans closer to the field near the goal line and south end zone. Del Conte also took his time learning the entire athletic staff, figuring out who does what. Ultimately he chose to lay off various employees from all over the department. The Statesman first learned that at least 13 had been let go, but a source later said the number was 24. Other open positions would not be filled, reducing the staff total by about 40. Del Conte openly admits that “I have no control over wins and losses.” His job is to provide coaches and athletes everything they need to be successful. He’s stated mission is for every team to be ranked among the top 10 and competing for national championships. “He has embraced us and the challenge like nobody has ever done,” Reese said of Del Conte. Other coaches are on board. “We have to make this place the most special place where other schools are envious,” new track coach Edrick Floréal said at his introductory press conference. Of course, UT fans will have a dramatically different view of everything if the football team can resume its winning ways. “Football is the engine that drives the bus,” Herman said in May. The 2018-19 athletic year promises to see more growth. Both the football and men’s basketball programs have highly-touted freshmen classes joining the fray. Women’s basketball has another bumper crop of talented newcomers, too. USC will be at Royal-Memorial Stadium on Sept. 15 for a prime-time rematch of last year’s terrific game in Los Angeles. If the Longhorns can win, fan energy will surge. “I’m just trying to get the train rolling,” Del Conte said. Next story: Revisiting the Texas Ten: How did our top preseason UT athletes to watch fare this year? Revisiting the Texas Ten: How did our top preseason UT athletes to watch fare this year?